Argonaut Peak (at left) as seen from Mountaineer Creek Valley with NE Gully at upper left. Paul and I spied this aesthetic line last April while finishing a climb of Dragontail's Triple Couloirs. We unanimously agreed that it would be our route of choice up Argonaut. Not having heard or found much to read about the route (Beckey guide seemingly offers vague and misleading information), we thought we were onto something unique and rarely climbed and so kept out little secret quiet for almost a year. So, it finally came to pass that Tod Bloxham, Martin Cash, Paul Klenke, and I climbed the narrow Northeast Gully on a Sunday in early may. We left the trail a little over a mile past the Colchuck Lake junction, aiming for the north basin below Argonaut Peak. In another couple of hours we found ourselves in the north basin at the base of the Northeast Gully. We were following a boot path. The gully didn't look too intimidating and it wasn't. It maintains a fairly constant angle of about 40 - 45 degrees for its 1,200-ft gain (approx. 7,000 ft up to 8,200 ft). The gully narrows down to a squeeze no more than 10ft wide. Once past the constriction, we continued up past a noisy fountain spewing from an ice floe to reach the top of the gully. The rock transition from gully to upper NE-facing snowfield required technical climbing. Martin and I followed a 5.6 crevice to the left (interesting climbing in plastic boots!) while Tod and Paul took an easier route to the right. This got us to the upper snowfield whereupon we met the twosome we had seen earlier. This twosome (a Erick and John) had been rebuffed on their first try up on the crest above. We contoured the north slope to avoid the small notch on the east-west ridge crest. This notch typically requires a rappel to get into to continue on the ascent. Some steep snow with little in the way of run out got us into a larger notch just below the summit. On the way, we'd set off sloughalanches that would turn in to cartwheels of snow. Unfortunately, these cartwheels wouldn't last, breaking up into smaller pieces and stopping. It would have been cool to see a cartwheel grow and grow to an enormous size as it rolled down and down and down and down. Our route across the northeast snowfield gained the crest at a shallow notch beneath a striated rock slab. From there it was Class 3 scrambling to the summit blocks then a short but easy and unexposed Class 4 step up to gain the highest point. Meanwhile, after calling out to Erick and John that they should follow our route to the top because it was all easy, they never showed up. They just gave up. Perplexing. We were the first party to summit (at least sign the register) this year. Lots of notable names in the register (John Roper , Lowell and Carl Skoog ['91], Roger Jung ['01], and Eric Hoffman['02], to name a few) but none had signed it at an earlier date in the year than our May 2. This seemed strange but perhaps the register is buried in snow in winter. 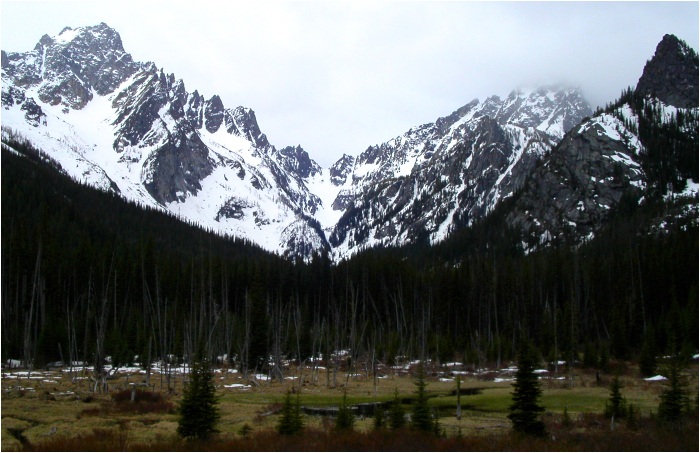 Mount Stuart beckons...I can hear the Ice Cliff calling me. Looking down Fourth Creek Valley towards the Cle Elum flatlands. Looking north at Eightmile Mountain (left) and Cashmere Mountain (right). We were good on time and decided to tag the summit of Colchuck Peak and return via Colchuck Lake instead. We rappelled down the east side so we could get to the East Gully for our descent (you can see John of the other twosome descending the gully farther down). We did a double-50m-rope rappel to get to a ledge that allowed access to the top half of the gully. Saying goodbye to Jason of the Argonauts, we slogged in the berating sun towards Colchuck Peak. The east side of Argonaut Peak with East Gully and upper NE-facing snowfield plainly visible. Before long, we found ourselves on the summit of Colchuck which I have been on twice before and Paul once before (the other two were Colchuck newbies). Chimney Rock to Mount Daniel from Colchuck's summit. Looking over Argonaut's north slope with Mount Rainier in the distance. On the summit of Colchuck Peak. Beyond are Cannon Mountain and Enchantment Peak. Myself, Paul, and Martin high-tailed it out of there as soon as Tod started singing (if that's what you want to call it) the lyrics to McLean's "American Pie". Descending the Colchuck Glacier, we honed our glissading skills. By 8:30PM we were back at the trailhead aching from all the uneven steps on the snowy trail. 14.5 hours round trip. All-in-all, we covered about 3.4 miles of trail, 1.8 miles of off-trail to the couloir, then maybe 0.5 more miles to the summit. The return via Colchuck Peak then Colchuck Lake is about the same distance.